The Aspis Consortium employs many unscrupulous individuals in its conniving plots to achieve wealth and subversive dominion throughout the Inner Sea. Aspis agents are the Consortium's chief instruments in this endeavor—public ambassadors who put a pleasant and disarming face forward while deflecting attention away from the company's true interests and activities. Aspis agents research ancient lore to discover long-lost treasures, then organize expeditions to recover them for their leaders—usually higher-ranking Aspis agents. Their careful study of the traps and hazards of ancient ruins helps agents evade danger themselves while leaving such threats intact for competing treasure hunters to face. To qualify to become an Aspis agent, a character must fulfill all of the following criteria. Skills: Appraise 5 ranks, Bluff 5 ranks, Craft (traps) 5 ranks, Disable Device 5 ranks, Intimidate 5 ranks, Knowledge (history) 5 ranks, Perception 5 ranks. Special: Proficiency with the whip, as well as either the trap sense class feature or the ability to cast detect secret doors. The Aspis agent's class skills (and the key ability for each skill) are Bluff (Cha), Disguise (Cha), Knowledge (arcana) (Int), Knowledge (history) (Int), Sense Motive (Wis), Sleight of Hand (Dex), and Use Magic Device (Cha). The following are class features of the Aspis agent prestige class. Weapon and Armor Proficiency: An Aspis agent gains no additional weapon or armor proficiencies. As the rogue class feature. Levels in Aspis agent stack with levels from any other class that grants this ability for the purposes of determining an Aspis agent's total trapfinding bonus. An Aspis agent gains a +1 bonus to AC and on Reflex saves made to avoid traps; this bonus increases by +1 every 3 levels after 1st. Trap sense bonuses gained from multiple classes stack. At 2nd level and every two levels thereafter, an Aspis agent gains one of the following agency secrets. An Aspis agent can't select an individual agency secret more than once. Bluster (Ex): An Aspis agent takes no penalty on Intimidate checks against larger creatures, and larger creatures gain no bonus on Intimidate checks against her. 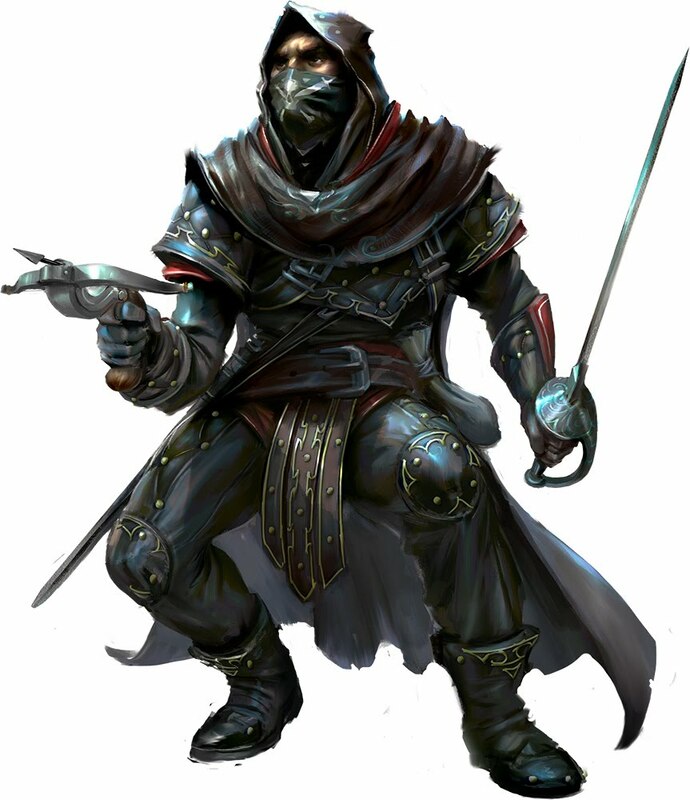 Bonus Feat: An Aspis agent may choose one of the following as a bonus feat: Advanced Ranger Trap, Antagonize, Combat Expertise, Enforcer, Greater Dirty Trick, Improved Dirty Trick, Improved Whip Mastery, Intimidating Prowess, Learn Ranger Trap, Skill Focus (Intimidate), Whip Mastery. She must meet the prerequisites of the selected bonus feat. Conceal Thoughts (Su): An Aspis agent targeted with detect thoughts or a similar effect may choose what thoughts are detected, while her true thoughts remain private. This does not affect mind-affecting effects other than thought-reading. Exotic Performance: An Aspis agent with the bardic performance or versatile performance class feature increases her effective bard level by 1 for all effects related to performances, including learning new types of performances and increasing the effects of her performances. Hidden Stash (Ex/Sp): An Aspis agent gains a bonus equal to her class level on Sleight of Hand checks to hide small objects on her person. In addition, once per day she can hide the magical properties of one item as magic aura. Master Caster: An Aspis agent able to cast spells as a bard or inquisitor increases her caster level for that class by 1. She does not gain other benefits of that class other than spells per day, spells known, and an increased caster level. If the agent has levels in both classes, she must choose which class to apply this increase to when she takes this agency secret. Rogue Talent: An Aspis agent can select one rogue talent for which she qualifies. Her Aspis agent levels stack with rogue levels for any rogue talents she possesses with level-dependent effects, whether they were gained from this prestige class or another class. Shrunken Smuggle (Sp): An Aspis agent can cast shrink item once per day, using her class level as her caster level. In addition, while the item is shrunken, it is also affected as nondetection. This effect ends when the item returns to its proper size. At 2nd level, as a standard action, an Aspis agent can alter her alignment aura to deceive effects that detect alignment. She may choose to be detected as any specific alignment she chooses or as no alignment. This affects only alignment detection, not effects that cause harm or are otherwise based on alignment. This effect lasts until she dismisses it or changes her alignment aura again. At 6th level, an Aspis agent targeted with an effect that detects alignment or with any alignment-based effect can automatically identify the effect by making a Spellcraft check. If successful, she can assume a false alignment as an immediate action. At 10th level, when an Aspis agent assumes a false alignment, she is treated as having that alignment for all effects of magic items, spells, and spell-like or supernatural effects (such as forbiddance, sympathy, or an unholy weapon), including magical traps based on alignment. While masking her alignment, she ignores these types of effects that relate to her true alignment. This ability is exactly like the rogue ability of the same name. The extra damage dealt increases by +1d6 at every third level (3rd, 6th, and 9th). If an Aspis agent gains a sneak attack bonus from another source, the bonuses on damage stack. At 3rd level, an Aspis agent can specially rig a mechanical trap she has either crafted or bypassed by exceeding its Disable Device DC by 10. A trap so made can be triggered by the Aspis agent as a move action as long as she is adjacent to the trap. She adds her trap sense bonus to the trap's Perception DC and on the trap's attack rolls, and adds her sneak attack damage to the trap's damage if the target is flat-footed or otherwise denied its Dexterity bonus to AC. At 5th level, an Aspis agent can combine infuriating smugness and sneering mockery with Bluff checks to feint, Intimidate checks to demoralize, and dirty trick combat maneuvers, gaining a bonus equal to 1/2 her class level on these checks. She may then delay the effect of the successful check for up to 1 day per class level, spending an immediate action to trigger it later. The Aspis agent must be within 60 feet to use or trigger a crucial taunt. This is a language-dependent effect. At 7th level, an Aspis agent's trap sense bonus applies on all saving throws made to avoid trap effects. At 8th level, an Aspis agent can use her ambush trap ability on a trap up to 30 feet away.